If you’re anything like myself, as a mother, beauty bits tend to spread a little bit farther into the house than the dressing table. I’ve had face masks stored on my bathroom shelf, on my bedside table and on my bookshelf in the living room, all simultaneously. Whether for ease of access, not wanting to apply certain things around my son (nail polish for example), or just not taking a delivery upstairs out of pure laziness, we ended up with little bits all over the house. It was mainly my other half that prompted a clear-out, until even I realised the mess of beauty was getting too much. Ever categorical, below are the bits I’ve decluttered and why. Hair: I felt a bit mean getting rid of this because I got it for free from an Instagram giveaway: the Kitenest Organic Dry Shampoo for light hair. I really tried to like it, to the point I’d let my hair get greasy in an attempt to work around its awkwardness, but I just couldn’t. Ethically, I adored the concept. Natural ingredients, cruelty-free, vegan friendly and of course the fully recyclable packaging, including biodegradable cardboard for the tub itself. I’m not sure if my hair was a tad too dark for this – being formulated for lighter hair – as upon application, it pretty much just sat like a white dust. If you want to test it out (it smells great, by the way) and your hair is anything other than blonde, definitely go for the dark formula. As for its success in working as a dry shampoo and eliminating/reducing grease and oil, it didn’t really ‘blend’ or ‘spread’ through the hair as I’d have liked. I found myself using more than I probably should have just to cover the top of my head. Once the whiteness had gone and I actually had enough on my hair, I did find it somewhat refreshing, but nothing like the bigger dry shampoos on the market. Skin: Firstly, I decided to bin the Nivea 3 in 1 Refreshing Cleansing Wipes. A few reasons; through religiously using Micellar water to remove make-up or refresh my skin, I didn’t really find a use for these wipes. Then, after delving deeper into what my skin needs, I’ve gotten familiar with going as natural as possible: these wipes are hugely scented! Although I’ve mentioned them before as being mega exfoliating and refreshing, the scent really concerned me! If I wouldn’t use it on my baby’s bum, I shouldn’t be putting it on my face, near my eyes or lips. Makes sense! Second, Sainsburys’ my skin matters Purifying Clay Mask. This attracted me at first as it appeared to be a cheaper alternative to the L’Oreal Pure Clay masks – similar packaging and all. The scent of the mask resembled some questionable teenage face washes I’ve used in the past and after using it a couple of times, I realised all it really did to my skin was cause more breakouts and a high amount of oil. Not cool – it had to go. 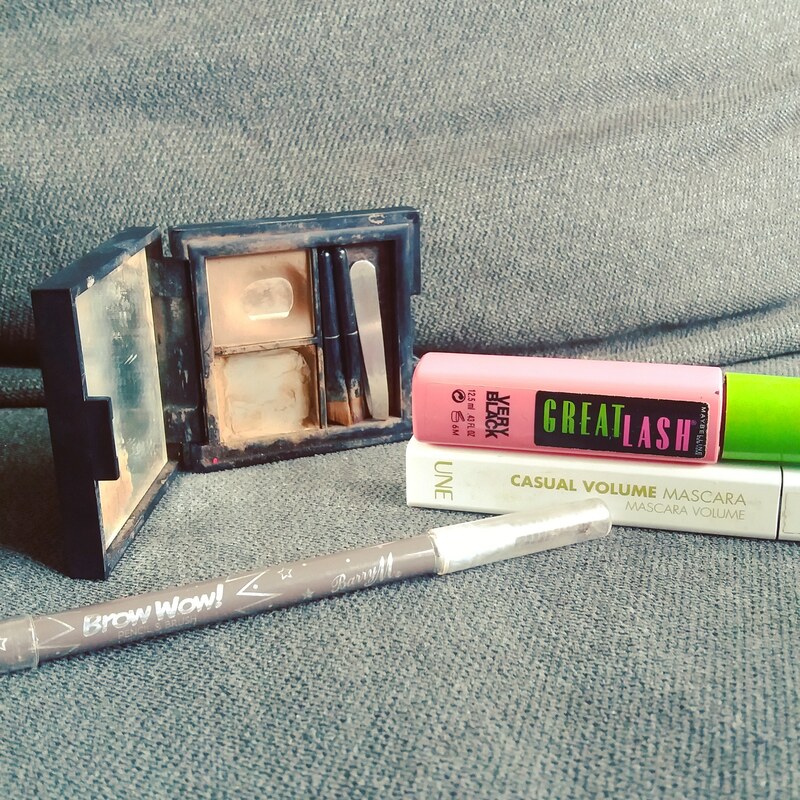 Brows and lashes: Of the four products in this category, there was only really one I disliked, purely because I prefer other formulas, and that’s the Barry M Brow Wow! pencil and spoolie. The spoolie came in handy, however I’m just not prone to pick up an eyebrow pencil and instead prefer my creams. The Sleek eyebrow palette had seen better days – having completely panned the cream bit – and so it was time for a declutter. It’s my all-time favourite brow product, however I’m currently using a Revolution alternative as it’s a bit cheaper and almost as good! The mascaras: Maybelline Great Lash and Bourjois Une Casual Volume Mascara. Again, both great mascaras, but your guess is good as mine as to how long I’ve actually owned these. If I began applying them to my lashes, I’d probably get gangrene. If that’s a thing with eyelashes. Misc: It would have been too much to categorise the last few items as they don’t really fit in anywhere! The Gypsy Shrine Face Jewels I purely had no need for! That goes for the tiny blusher brush also – just horrendous, aren’t they? I’m not quite sure where it came from! The Bourjois gold liner, though I’ve raved about the brand previously, just did not show up on my eyelids despite attempting an array of looks. The brush was a little too flimsy, I feel, which also didn’t help – thus no point holding on to it. The NYX Turnt Up lipstick frankly made me look like a clown. Although a pretty shade at first sight, the formula made it so that application was almost Crayola crayon-like and left an odd, bright sheen on my lips, completely draining the rest of my face of colour. Younique Moodstruck Lip Exfoliator: This was ok, but it was basically a sugar stick which turned out to be fairly messy every time I tried to use it. Definitely not a practical product to keep in your handbag or on the go generally. The consensus is to use it and let the sugar dissolve, but ain’t nobody got time for that. So for this reason, I didn’t use it a fat lot and felt no reason to hold on to it! Younique Beachfront Self-Tanning Body Lotion: This wasn’t actually a bad gradual tanning lotion, especially in comparison to that horrific Dove one I mentioned in a previous blog (check that out here!). It was a bit streaky – being my only complaint – but I’ll put that down to my inexperience with tanning. Coming into the winter, I barely bother with tanning, plus the product itself is quite old, so again – gangrene! That concludes my recent declutter of beauty bits! Coming up, I have reviews of Anatomicals, what’s in it for you?, as well as a (I’m hoping) fantastic product I’ve nabbed free from Dr Botanicals – we all know how much I loved the Po mask! Aside from that, I feel I’ve branched away from the original purpose of my blog. Although I love beauty, I’d like to get back into writing raw thoughts about aspects of motherhood, mental health, childhood and some lifestyle bits! Let me know if that’s something you’d love to see back on this blog! I’m beginning the last module of my degree very soon, which is creative writing based, so I’m excited to get some fabulous writing on my blog also. Until then, take care of yourselves! Next What are you writing?